Audio playback board using APR33A3 IC for 8 channels of recording. Total 11 minutes of recording time each channel(M0 to M7) having 1.3 minutes of recording time. Single chip, high quality voice recording and playback solution. User friendly and easy to use operation. 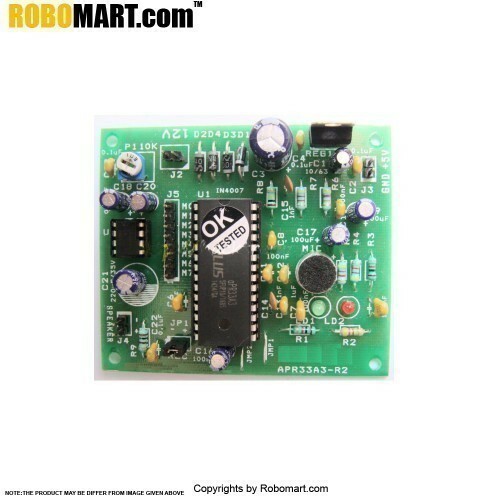 Audio output to drive a speaker or audio out for public address system. we can use 8 channels(M0 TO M7)each channel having 1.3 minutes recording length. Onboard MIC will automatically be used for recording. Switch on the board power LED(LD1) will on. Put the jumper in the board JP1(REC) Section. While in record mode select J5 (M0-M7) to select a channel to record the message. Let us assume we want to record message in channel M0, Connect M0 to GND (IN Board J3-VCC, GND). Now whatever we speak will be captured by MIC and recorded, status LED(LD2) will on in record mode indicating that chip is currently recording. Once duration is full the LED(LD2) will off means that segment is full. Now you can disconnect the GND Connection from M0, if before the duration is this connection is removed, then that many seconds are recorded and rest duration is kept empty. Connect the speaker to the board J4 Speaker section. Now connect the MO(J5)to GND(J3) Section, status LED(LD2) will ON till the recorded sound play in the speaker. "This procedure same for the remaining channels also"
How to use with Microcontroller ?